Feel hard to climb the mountain or want to modify your old 10 speed group set to 1X system? Our product may be the cheapest wide ratio modify solution you can find in the market. The only thing we sacrifice here is the weight, if you don't sensitive to the weight, our product may be your best choice. SRAM 10 Speed MTB derailleurs are generally compatible (check its chain wrap capability), Shimano derailleurs require a longer B-tension screw. Our package include a stainless steel B-screw and a 3 mm Allen key to install it. So you don't need to buy them from other seller. Fits on Shimano or Sram compatible freehubs. SRAM / Shimano mid or long cage derailleur only (check its specs for chain wrap capability). For Shimano HG splined freehubs. [EXTRA GRANNY COGS FOR EVERYONE!] - Bring the 1X experience of 11 or 12 speed to 10 speed. Now you can ditch your triple speed parts and convert the earlier type 30 and 20 speed bikes to 1X. Shifting will be much easy and simple to your loved ones! [COMES WITH FREE EXTENDED B-SCREW.] 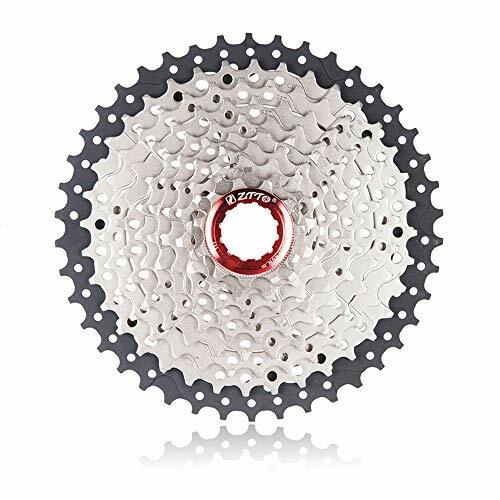 - Made from high quality stainless steel, it will make most of 10 speed rear derailleurs compatible with 42t cassette, just replace your stock rear derailleur b-screw and adjust rear derailleur again. [WIDE GEAR RATIO.] 11, 13, 15, 18, 21, 24, 28, 32, 36, 42t. Compatible with standard cassette freehub, not compatible with freewheel system and XD system. [HIGH QUALITY, BUT LOW PRICE.] - All the cogs are made from high-tensile steel, extremely durable and hard to break. Offers same level of performance with much more expensive products, but only cost a small fraction of the price. [SHOP WITH CONFIDENCE.] - Our Cassette Have One Year Warranty, If You Met a Quality Defect Product, You Can Contact Us to Get a Refund or Replacement.